Women on Campus is a collection of compelling essays from the staff of Change, the foremost monthly magazine on American higher learning. This widely praised collec-tion of essays on the feminist struggle for greater participation in American academic life presents a portrait that was rarely reflected in the academic journals. 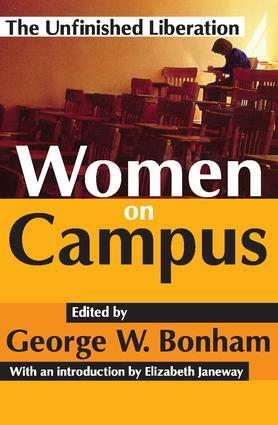 In this classic volume, now available in paperback, a wide spectrum of distinguished, outspoken authors discuss what, when it was originally published, was one of the major goals of American women: full equality in campus life. This widely praised collec-tion of essays on the feminist struggle for greater participa-tion in American academic life presents a portrait rarely re-flected in the academic jour-nals. In this volume, a wide spectrum of distinguished, outspoken authors discuss one of the major goals of American women: full equality in campus life. "Academia," says Elizabeth Janeway in her introduction to Women on Campus, "has been getting on without half the research talent and teach-ing skill it might have laid claim to just by ignoring women. "